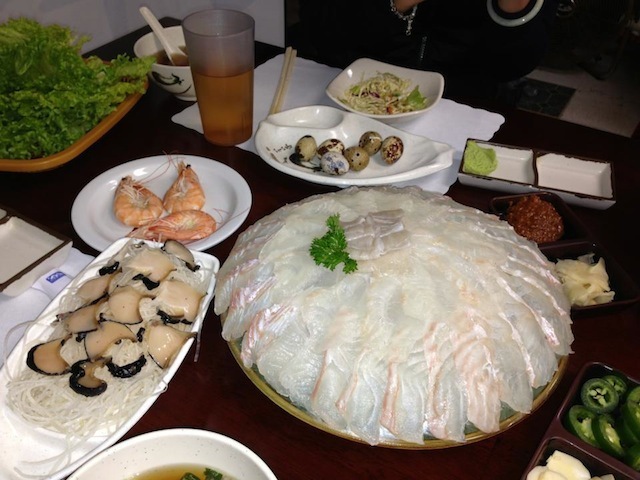 Dongbu Live Fish is a small, family-run restaurant located in a small Rowland Heights strip mall. The specialty at Dongbu is hwal uh, which refers to the Korean-style sashimi. Upon entering the small restaurant, you see live fish and other sea creatures swimming in saltwater tanks. Although Dongbu’s menu is filled sushi and other items, the star of the show is the live halibut sashimi. It comes in four sizes from x-small to large. The XS is $65. Don’t trust the size! It is a lot of food since it comes with multiple other dishes. An XS could probably feed three people. Our meal started with quail eggs, edamame, and an array of Korean condiments to accompany our appetizers. Next came soup and salad. The salad was like a cole slaw with a sweet vinaigrette sauce. It also had roe and halibut and tossed inside as well. The star of the show of course is the freshly caught halibut. It is served on an ice platter. The sashimi tastes extremely fresh. We also wrapped the halibut in the lettuce leaves provided. Accompanying the halibut platter were eight additional dishes. The raw abalone was a bit chewy. 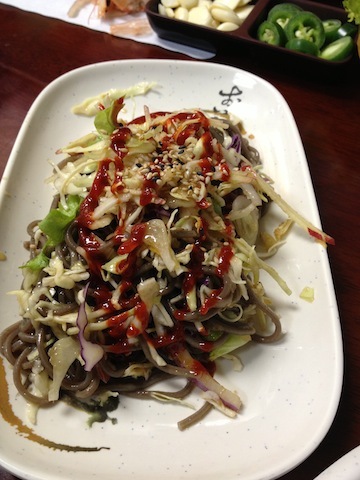 The naengmyeon aka cold noodle was one of my faveorites. It had salmon, halibut, fruits, and cabbage all mixed in with a kick of spice! Next they brought out baked mussels with imitation crab. We also had shrimp and fried sardines as well. The macakrel was grilled really nicely. The skin was perfectly crispy. The meal ended up another bowl of soup. 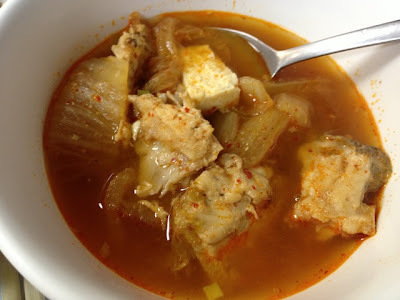 This soup to end the meal was a spicy fish soup. The service was exceptional. The entire family was so nice and accomdating. Despite the small parking lot, there are a few spaces reserved for Dongbu customers so make sure to check before you go parking across the street. Enjoy!